✿Support Bluetooth. You can play music under bluetooth mode. ✿Longtime Playbacks. Up to 70 hours of audio playback when fully charged. ✿Support FM Radio. Built-in FM tuner lets you listen to your favorite radio stations and recorde them. ✿One Key To Lock Button. Aviod being pressed by accident. ✿USB 2.0 Interface. High-speed USB 2.0 connection ensures quick transfer files. ✿Works perfectly with your Car via AUX port. ♬ Voice Recorder: Support FM, MIC recording. Format support MP3, WAV. ♬ Support Language: English, German, French, Italian, Dutch, Portuguese, Spanish, Russian, etc. ◆ When playing music under Bluetooth mode, it is not allowed to go back to the main menu unless you disconnect with Bluetooth. ◆ This MP3 player is a Bluetooth transmitter, not a receiver, it only can pair with Bluetooth headphones or speakers, cannot pair with phones. 【Wireless Bluetooth Function】This MP3 players with Bluetooth function.Fast and stable transmission and high anti-interference ability provides you a pleasant wireless music playing experience within 10m when there is no barrier.Stream your favorite music through bluetooth speakers,bluetooth earphones and headphone. Please note:It also compatible with some cars of 0000 PIN code only (not with random PIN). 【Hi-Fi Lossless Sound Quality】Professional intelligent digital noise reduction chip is adopted to reduce noise and support all major popular Formats:MP3、WMA、APE、FLAC、WAV、AAC-LC、ACELP. 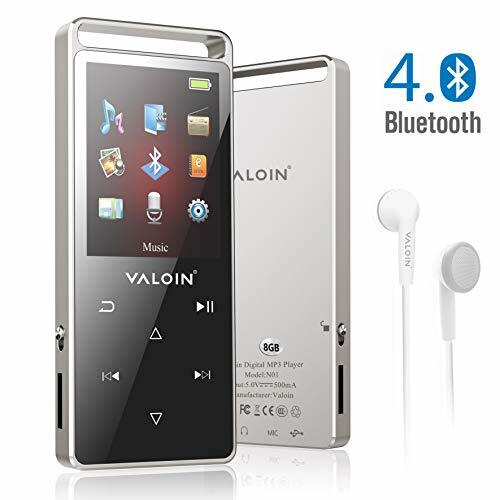 【8G Internal Memory & Up to 50 Hours Playback】This bluetooth mp3 player with built-in 8G memory and support up to 128G via micro SD card. (NOT INCLUDED).Equipped high capacity lithium battery provides up to 50 hours of playback time and 30 days of standby after fully charged. 【Designed with Elegant Appearance】This meatl case make this mp3 player more durable,delivers the elegant apperance.Equipped with senstive touch buttons make it easy operation without any noise in quiet place,gives you a better user experience. 【Amazing Functions】More than a mp3 player to enjoy music,it also supports FM radio, pedometer,folders, E-book, picture viewer, recording etc. This is a good choice for music lovers,ideal for sport and working.100% new product with high quality,1 year warranty and 30 days moeny back and easy-to-reach support.